Since the 1990s, bark beetles have collectively killed billions of trees across millions of acres of forest in western North America, from Alaska to northern Mexico. Although a force of natural change in forest ecosystems, the increased intensity, expanded range, and synchroneity of recent bark beetle outbreaks have proved the most devastating in recorded history, and there seems to be no indication that future infestations will slow. 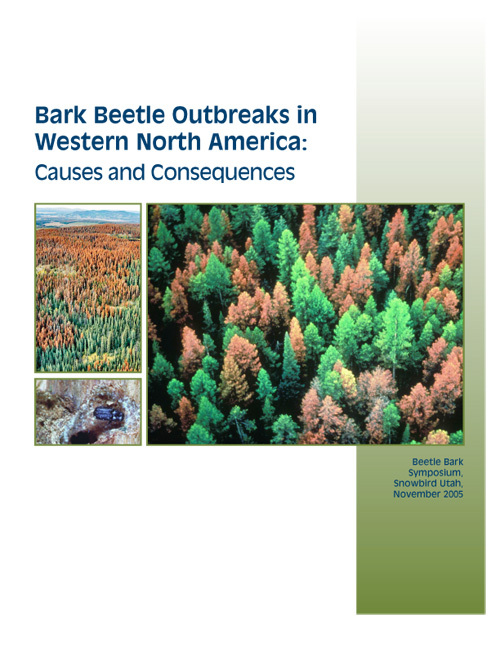 Bark Beetle Outbreaks in Western North America: Causes and Consequences is the result of a symposium convened in by scientists with the US Forest Service Rocky Mountain Research Center. Entomologists, ecologists, and foresters from across the continent gathered to share research in an effort to understand the causes, historical context, and short- and long-term consequences of the current outbreaks. This easy-to-read book examines the ecology and biology of bark beetles, the extent of historical and current outbreaks, and the potential consequences of such widespread infestations on forest ecosystems. Factors contributing to increased outbreaks, such as climate change, natural disturbances, and human influence are discussed, and possible preventative measures proposed. Foresters, park managers, landowners, and environmentalists will all appreciate gaining greater understanding of the threat that bark beetles pose to the great forests of North America. Distributed for the United States Forest Service.